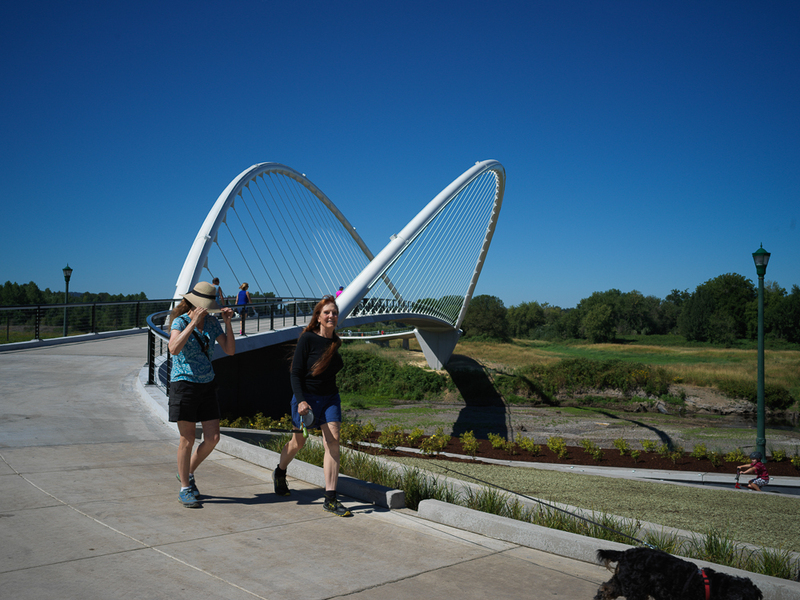 A little south of the Center Street Bridge is the recently opened Minto Island Pedestrian Bridge. The bridge doesn't actually cross the Willamette River but crosses the Willamette Slough on the west side of the island. 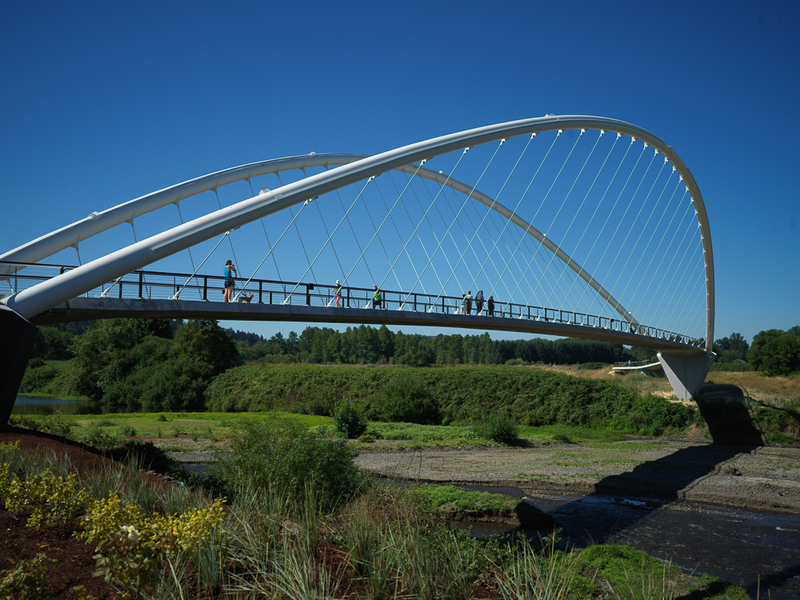 This project took almost 10 years from the initial proposal to the completed bridge. In 2008 several design options were studied. In 2010 a 600 ft long tied arch with a 14 ft wide deck was selected. In 2011 the city obtained a permit to cross over the slough. In 2012 OBEC Consulting was hired to complete the design of the bridge. Construction (by Legacy Contracting) began in 2015 but delays set the project back a year. Even small delays can ruin schedules since work in sloughs are limited to a few months out of the year. The bridge was finally opened in May of 2017. The $10 million in funding came from the City of Salem, the Oregon DOT, and smaller groups such as Friends of Two Bridges. 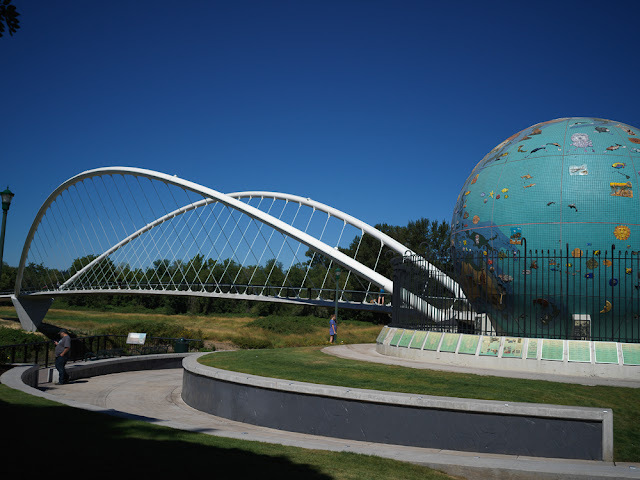 The bridge provides access between Salem's Riverfront Park and Minto Island. Part of the project was providing landscaping (by Greenworks) to integrate the bridge into the park. The city is anticipating the bridge's role in future events such as a yearly marathon. The bridge is a fairly simple structure. The two arch ribs are one inch thick circular sections, 30 inches in diameter, that rise 44 ft above the deck and extend 327 ft between the triangular abutment/piers. The concrete deck acts as a tie to restrain the arch ribs. The arches are inclined at about a 30 degree angle from vertical, perhaps to provide lateral resistance (no cross-bracing is provided). Single cable stays support the deck and are attached to plates welded to the steel arches and securely anchored into the concrete deck. The bridge is reasonably attractive. A concrete deck for a steel arch bridge is a little annoying. Also, the black railing appears to be added without much thought to the aesthetics. 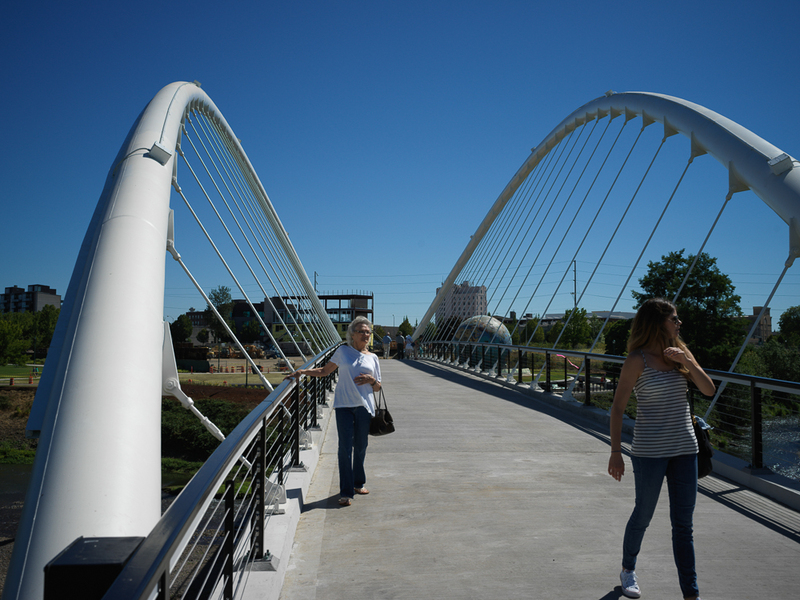 The bridge isn't innovative but it makes a pleasant addition to the city's bridges.